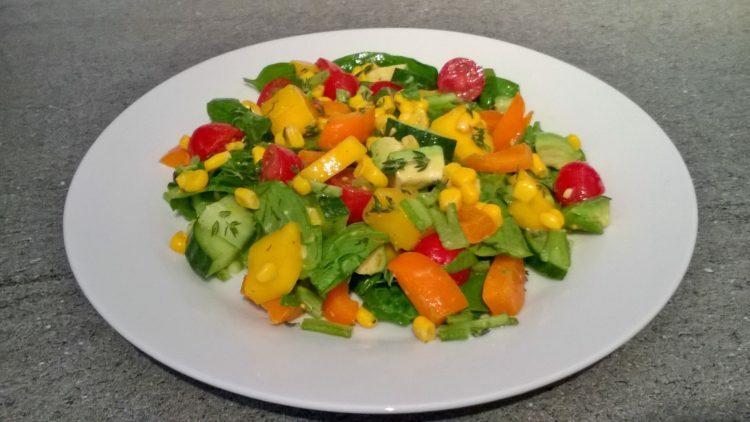 1 Put the baby spinach, tomatoes, orange pepper, mango, avocado, runner beans and sweet corn in a bowl and toss. 2 Place all the dressing ingredients in a jar with the lid on and shake or in a small bowl and mix until it all comes together. 3 Pour the dressing in the bowl all over the salad and toss, until all the salad is dressed in the dressing. 4 Serve up and enjoy!